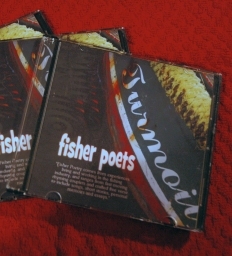 This one-of-a-kind anthology CD was recorded live at the annual Fisher Poets Gathering in Astoria, Ore. Sample the works of your favorite poets and musicians, or enter the fascinating maritime world of fishing and lyricism for the first time. Artists featured on the CD include Smitty Smith, Gino Leech, and Oregon Book Award Winner Clem Starck. The CD is narrated by Ship Report producer Joanne Rideout, who produced the anthology for Coast Community Radio. CCR broadcasts the Fisher Poets Gathering live each year from Astoria. Learn more about the Fisher Poets Gathering and In The Tote, an online archive of fisherpoetry, story and song. Note: clicking an “Add to Cart” button takes you directly to Paypal so you can pay securely with a major credit card. This compact, fold-out field guide printed on heavy, glossy stock explains the different types of vessels you are likely to see plying the waters around the region – what they are, what they’re carrying, and who’s on board. With one of these, you can practically do your own Ship Report! 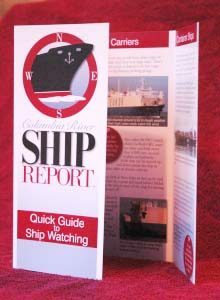 Buying a Shipwatching Guide is truly a “shop local” experience – a one of a kind, made-in-Oregon publication. Joanne, a professional journalist and photographer, took the photos and wrote the copy. She hired a local Long Beach, Wash., designer (Spence Photo Design) who worked her magic with the layout, and a local Astoria, Ore., printer (Anchor Graphics) who did a fabulous job of bringing it all to life. And the only place in the world you can get one is right here, or at a handful of brick & mortar shops in the Lower Columbia region. For a list of area merchants who carry the Guide, scroll down.